After taking a break from sharing our recent American Girl Birthday Party, I'm back today with our party decorations. As usual, I'm showing you not only what the birthday party decorations looked like, but I've got 4, yes 4, tutorials for you. They were so quick and easy I couldn't see doing separate posts. All of these decorations were easy to make as well as inexpensive…Yay! The hardest part, wasn't hard, it just took a while to make the approximately 50+ pom poms which were used in the decor. 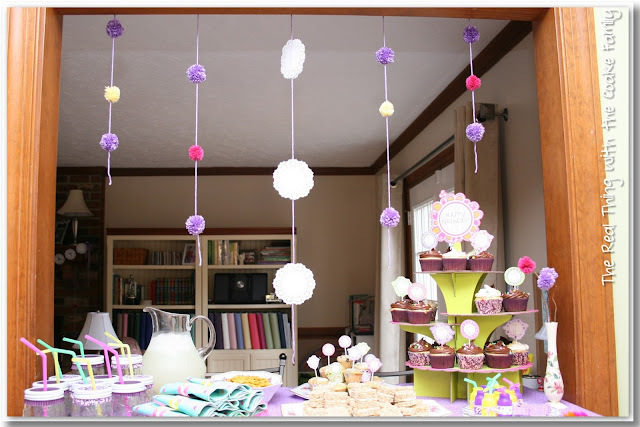 As you can see above, I used pom poms and doilies for the decorations for this Felicity American Girl party. I thought the doilies in particular fit with the colonial theme. 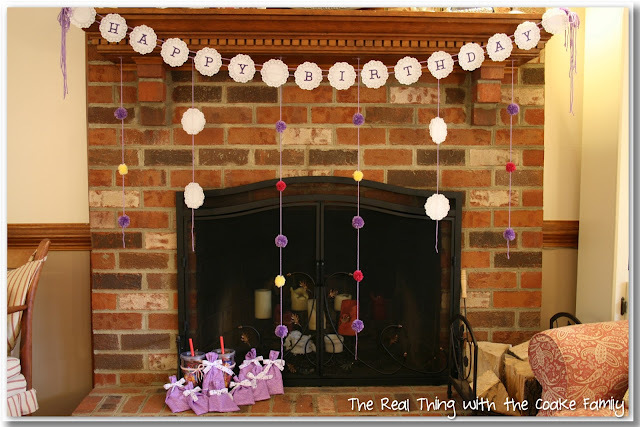 To make both the Happy Birthday Banner and the hanging doilie ‘streamers,' I used this one pack of 30 doilies. I found it in the baking section at Michael's. As you can see from the picture, they are small, only 4″. I separated the doilies. Being careful not to rip them and to make sure to get all 30. You can see the finished Happy Birthday banner above. Once I had all the doilies separated, I cut out letters on my Cricut. If you don't have a Cricut, you could purchase large letters in the scrapbook section of a craft store. 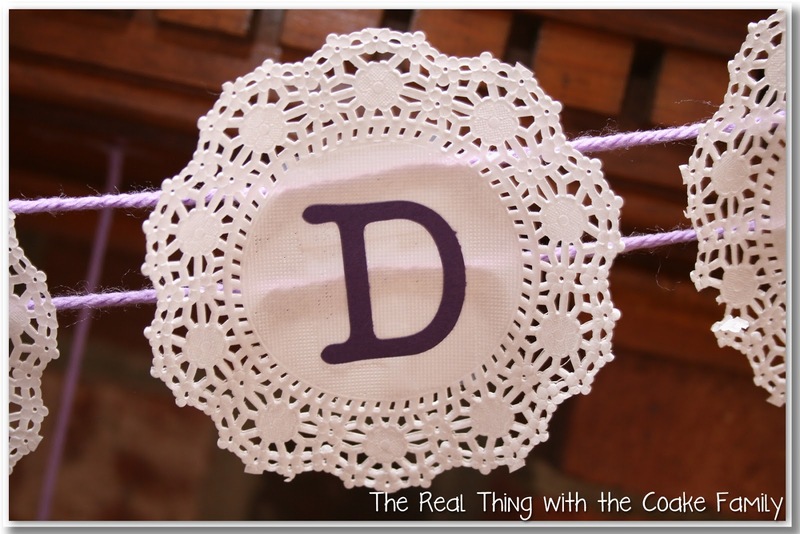 The letters just got glued to the doilies, placing the letters in the center of each doily. 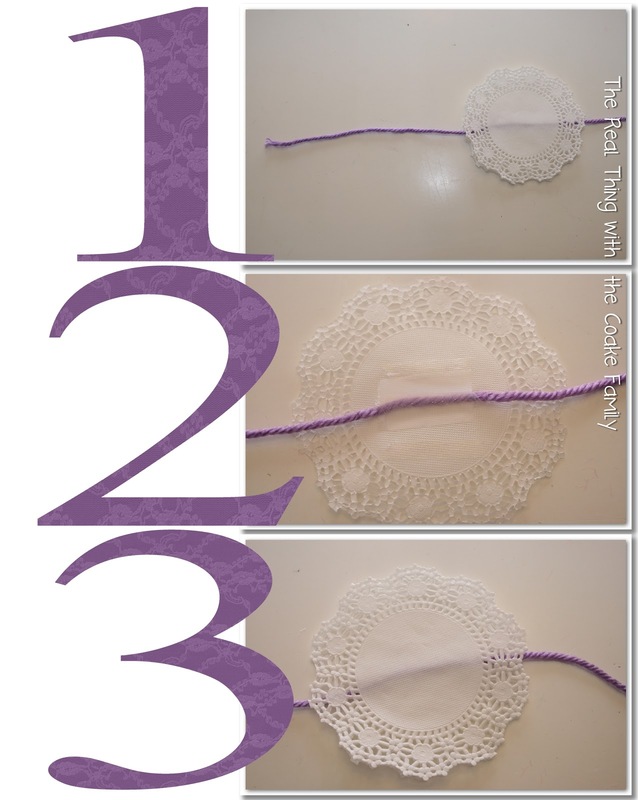 To turn the individual doilies into a banner, I cut a long piece of yarn and used regular tape. I taped the doilies to the yarn. I started with one piece of yarn, but the weight of the doily made the banner tip to where you couldn't see the letters. This was easily fixed by adding a second strand of yarn. 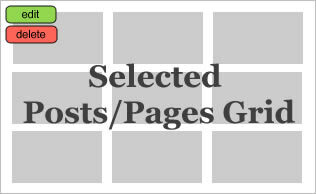 This kept the banner weighted properly. The only other thing I did was add some extra yarn and a pom pom to the corners where I was hanging the banner, just to give it something extra. Easy! and Done! Do you see the doily ‘streamers' in the picture above? I used my leftover doilies to make those. They were crazy easy. 1. Just cut the length of yarn you want your finished streamer to be. 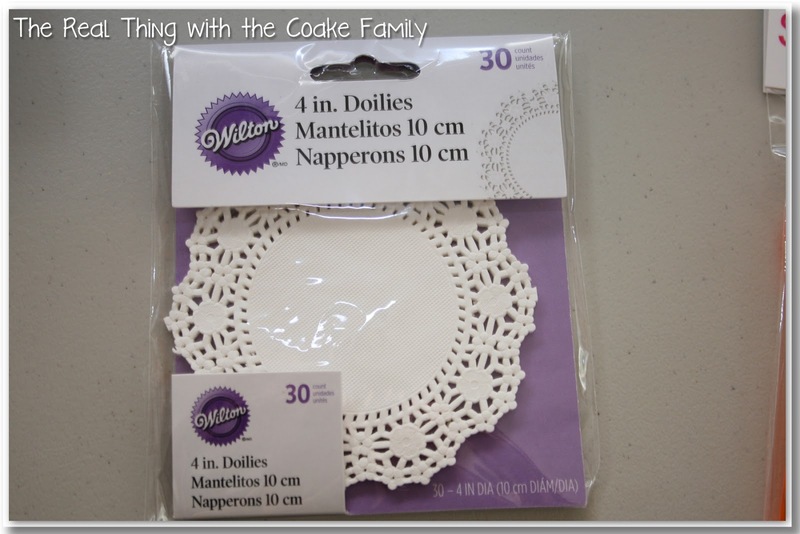 Evenly space your doilies. 2. 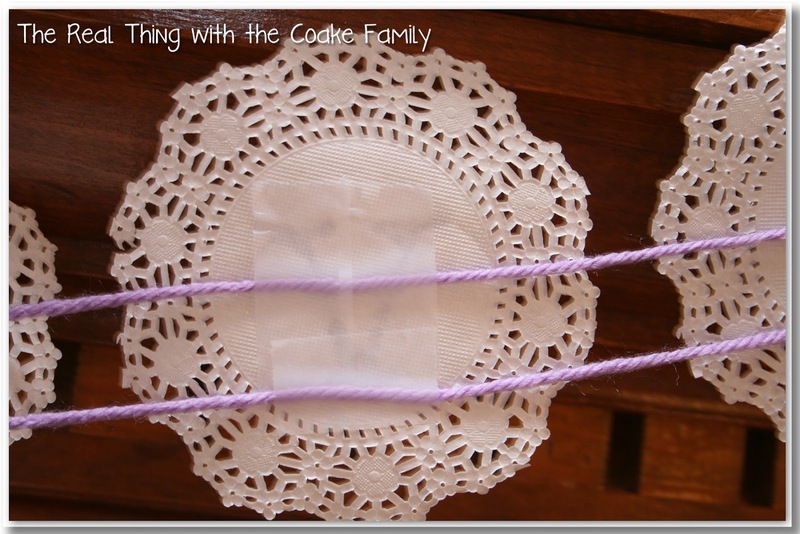 Tape the yarn to the doily. Use double sided adhesive on either side of the tape. I used a scrapbook adhesive that comes in a dispenser made to roll the adhesive on. 3. 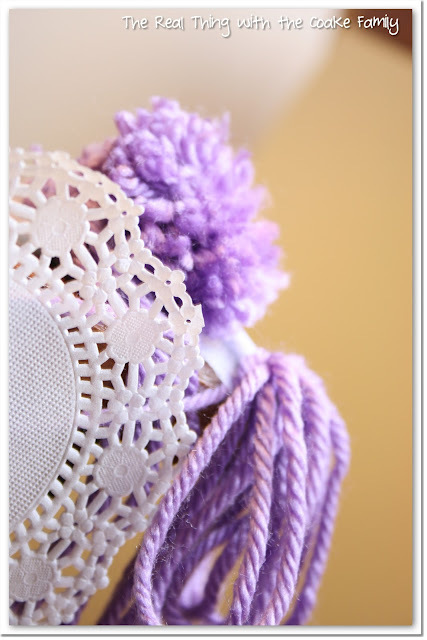 Place your second doily on top, carefully matching up the lace part. All done! Easy again! 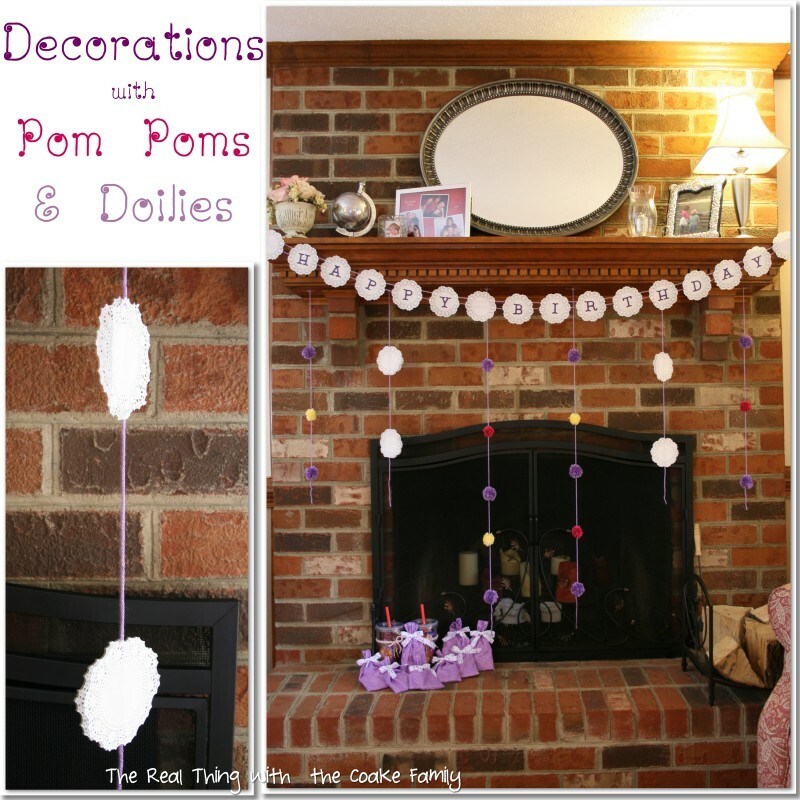 I used both the pom pom streamers and the doily streamers on our fireplace mantel and over our bar/pass through area. Cut the yarn a little longer than you want your finished streamer to be. Thread your pom poms onto the yarn one at a time, just like I showed you in the American Girl Pom Pom Scarf post. The only thing you need to do different is pictured above. 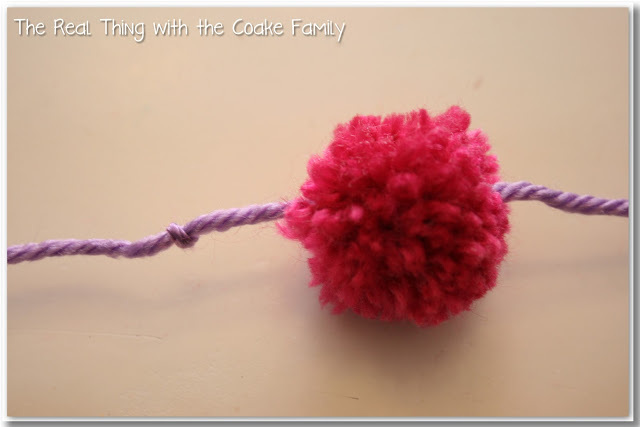 You need to add a double or triple knot in your yarn where you want the pom pom to stay. Once the pom pom gets to the knot, it should stay in place. 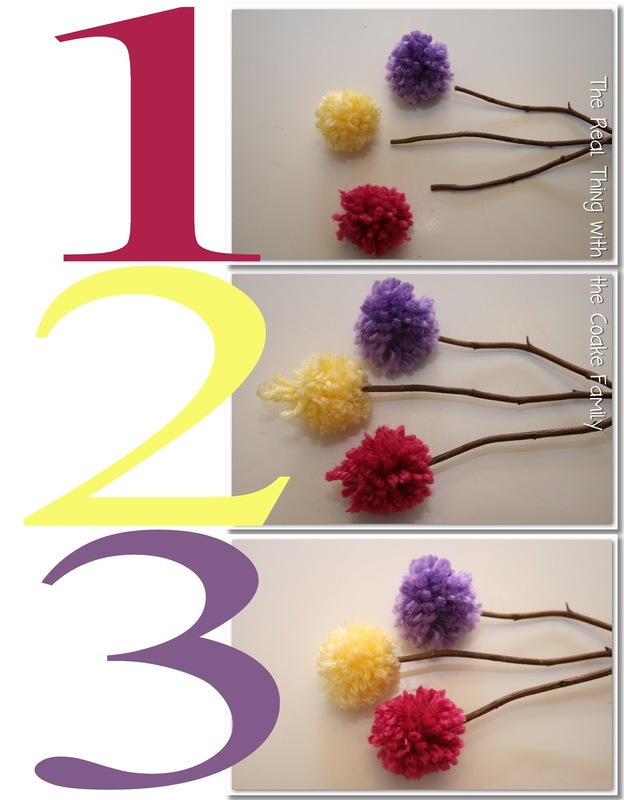 Continue knotting and threading until you have the desired number of pom poms on your streamer. While you are making pom poms for your pom pom streamer, make additional pom poms to make a pom pom bouquet (or two or three!). 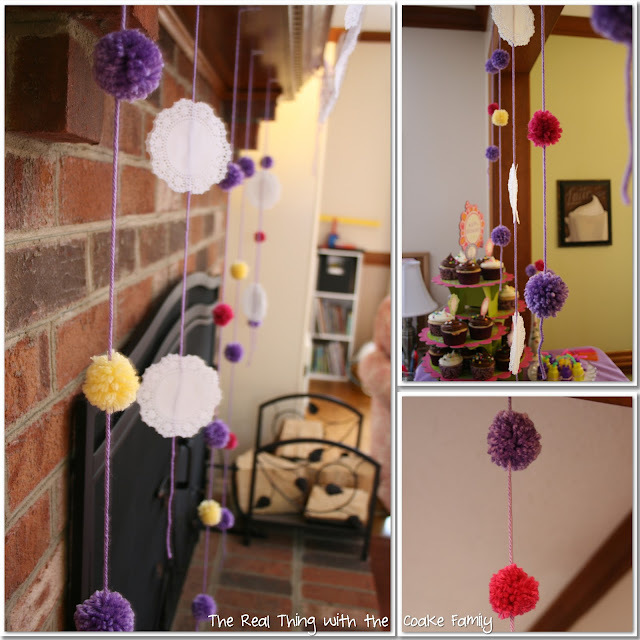 I got the idea for these from Aimee over at It's Overflowing (How to Make a Pom Pom Ball with Yarn). 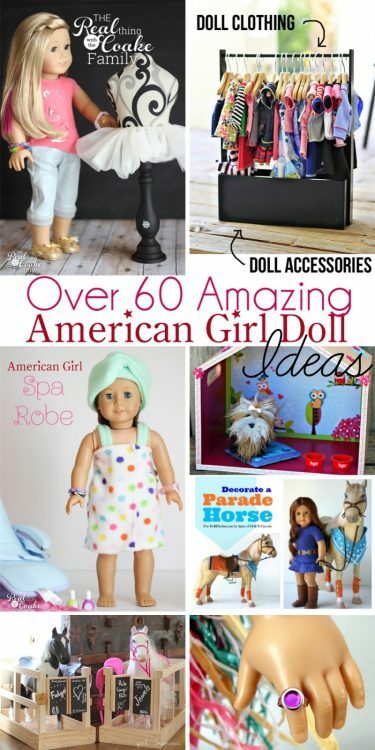 She has tons of fantastic ideas on her blog! I pinned this one thinking I would use it for a tea party, but never got around to the tea party. It seemed perfect for this party. 1. You can buy twigs at the craft store in the floral department. I had no idea…I don't really go to the floral department much. Anyway, I thought about just picking up twigs outside since we have tons of trees, but I doubt I would have been able to find them the right length and such a so on, so I went the easy way and bought the twigs. I cut them to the length I wanted. 2. Aimee, said she hot glued her pom poms to her twigs. I really don't like hot glue, so I found the center of my pom poms and just like threading them with yarn, threaded them onto the twig. As you can see, above, when I did that, it displaced some of the yarn. 3. Trim the yarn to make a cute little pom pom again! 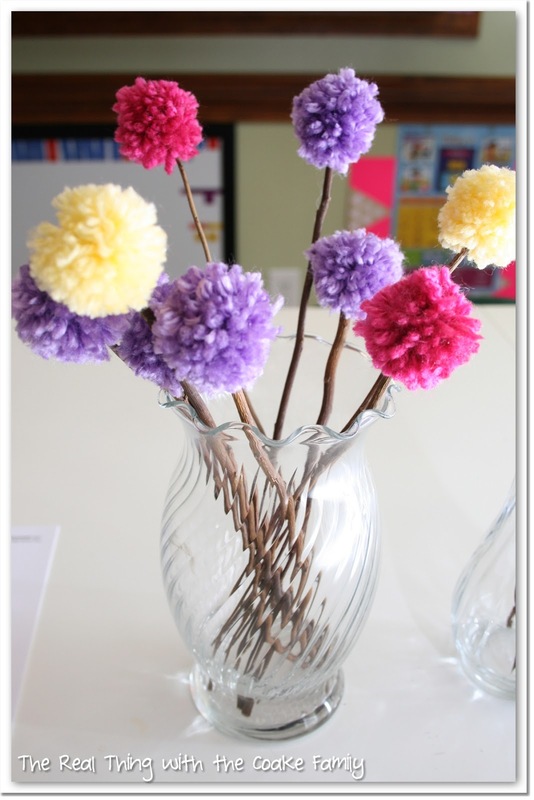 Arrange your pom pom twigs in your vase or other container. Once again you are already done! More cute, easy and inexpensive decorations! Love! Whew…you still with me after 4 tutorials? I hope you enjoyed them and didn't find it too much to put all in one post. We loved how the decorations added to the party. I think this may have been my favorite party I have ever done…so far. The decorations were not too overwhelming and not overboard for our budget, lifestyle and time that was available. What is your favorite party you have ever thrown? What kind of decorations did you use? i love the doily banner, seems like an easy idea! What a cute banner! Love it! Oh, Thank you. That is so sweet of you to say. I would love for you to share this on your facebook page. If you would be willing to tag my blog that would be aweome.